The North West Department of Forestry and police clamped down on illegal wood choppers in the Hartbeespoort area on Tuesday, confiscating tons of wood from trees chopped down in protected areas. According to the Kormorant, the illegal chopping down of trees in the protected Magaliesberg mountain range and Magaliesberg Biosphere has been of serious concern to the community and environmental organisations. 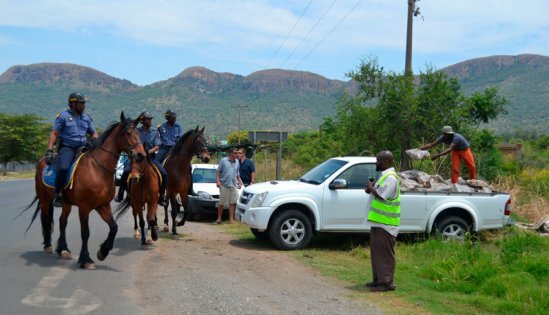 Following pressure from the press and community, the operation was held in conjunction with Sanral and with the help of the police's mounted unit and neighbourhood watch members. "Unfortunately the perpetrators put women and children at the road stalls to sell the wood and the real culprits are not caught. We need the community's eyes and ears to identify the areas where trees are cut down and where the wood is processed so that we can clamp down further," said Lufuno Newhufumba from the Department of Forestry. "We also welcome suggestions from the community on how to combat this destruction of the environment." A number of trucks and light delivery vehicles were used to pick up more than 15 000 bags of wood found at roadside stalls and in the veld. People who visit the Hartbeespoort area are urged not to buy wood from vendors along the road. By doing so, you are contributing to the devastation of an environmentally protected area.